Why book San Francisco Airport car rental at VIP Cars? Rent a car at San Francisco Airport with pricing inclusive of CDW, Theft Waiver, Unlimited Mileage etc. Catching a Flight to San Francisco Airport? Search, compare, and book best car rental deal for San Francisco Airport on our website from anywhere, anytime. VIP Cars helps you to search and book the best car hire deal for San Francisco Airport, making your journey as convenient as possible. A free of cost rental portal, we let you compare the rates for rental cars for SFO from a group of reliable brands. 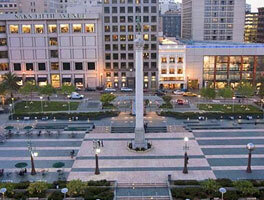 Looking for more reasons to book SFO Airport rental car from us? At VIP Cars, we have been engaged in comparing prices of rental car for past one decade. Our expertise in car hire domain has won us thousands of delightful customers. We constantly check for latest deals, along with lowest prices, across all rental car categories available with our renowned car hire suppliers for SFO. We don't include any booking fee or service charge when you book a rental car for SFO from us. No matter what sort of rental car you plan to book for SFO, the filters provided make it quite easier to search an appropriate car for you. Right from compact, economy cars to standard sedans and from van/minivans and SUVs to stylish convertibles and luxury cars, we have all sort of vehicles to cater to your commuting needs. Our partners offer a big list of vans and minivans which allow us to cater the needs of travelers who are traveling with a big group of people and luggage. With us you can book from 7 to 12 seater cars ranging from SUVs to vans. Mercedes C-Class, BMW, Chevrolet plus other exotic cars can be rented on VIP Cars. Note that suppliers don’t guarantee the exact model, however they always make sure that you get the luxury car of same size & type you booked online. Call us to know more. Passengers arriving can indulge in some souvenir shopping at the Gift Shops. The Currency Exchange and ATMs allow swift access to urgent need of cash. Postal Services like Federal Express are accessible for any Parcel/Postal dispatch. All the terminals at SFO airport have round the clock Free WiFi access. Workstations areas with laptop charging ports can easily be found at different corner of terminals. Terminal 1 has 5 shops and they are located in the terminal’s boarding areas B and C.
Its T1’s only shop where you can buy stuff that reflects the region’s culture, history, art & attractions. Besides its unique list of gifts, it is also popular for the Californian food and candies. It has various 24-hour stores which offer convenience and travel products. Shops in Terminal 2 are located in Retail Street. These 5 best describe the available variety. Terminal 3 has 29 shops; these 5, best describe the available variety. This place brings handmade jewelry and timepieces crafted by local artists. All in one, it is great for purchases like books, magazines, souvenirs as well as snacks, &beverages. If you want to taste Premium chocolates and gifts, it is the place for you. International terminal has 37 shops; these 5, best describe the available variety. Here travelers can buy duty-free accessories for men and women besides other products. Another great place to shop for accessories & handbags! Cosmetics, liquor, or designer products, duty-free offers you a great range of products. Terminal 1 has 8 restaurants; these 5, best describe the available variety. This is the place where you can eat anything from salads to sandwiches, and pastries. Here travelers can try sandwiches, main course, barbeque and sweet course. Popular for tea and coffee, it also offers pastries and sandwiches. Terminal 2 has 11 restaurants; these 5 restaurants, best describe the available variety. It has a full bar where travelers can enjoy a diverse menu of cocktails, wine, and beers. It is a restaurant which offers steak, seafood, and breakfast; it also has a bar. Terminal 3 has 24 restaurants; ; these 5, best describe the available variety. It is most popular for its sourdough bread, soup, salads, and sandwiches. It offers Irish coffee and American cuisine. Yogurt, yogurt, and yogurt. Here you can taste, fresh as well as frozen yogurt! It has 20 restaurants; these 5, best describe the available variety. It offers Vietnamese cuisine including spring rolls of shrimps and Bhan Mi sandwiches. Boarding Area F near Gates 60 through 69 (level 3). Mezzanine level near Gate 71A, Level 3. Boarding Area A, Level 3. 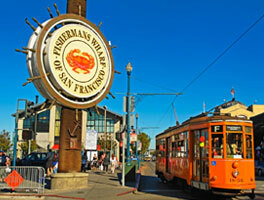 A fairly large place, San Francisco offers plenty of things to do and large number of attractions to explore. Using a rental car from SFO undeniably gives you the easiest way to move around from one location to another. From picturesque landscapes to iconic architectural marvels, you will find all in and around SF. 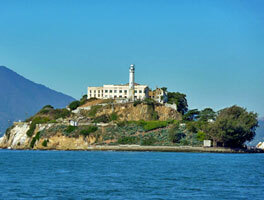 Take a look at most popular attractions of San Francisco. Whether you are looking forward to a leisurely stroll on a beach, some relaxing time in the woods, enjoy adventurous hiking, kayaking or wine-tasting, ample opportunities galore as you look beyond the boundaries of San Francisco. Crank the engine of your SFO car hire and drive right away to any of the following most sought-after road trips originating from San Francisco. Traffic moves on the right hand side of the road in the US. Speed as well as distances are measured in miles. All major freeways across California observe speed limit of 65mph. San Francisco Airport is located about 13 miles south of Downtown San Francisco. Choose Bayshore Freeway from SFO if you want to directly enter into city. Francisco experiences relatively warmer season staring from September until October. Don't forget to hire an air-conditioned car if you happen to plan a visit during that time. GPS is essentially required, in particular for business travelers, and in general for leisure tourists. Besides advising you on shortest routes, a GPS navigation system provides real-time traffic updates. Where to get the keys of pre-booked rental car at SFO? Like all other major North American airports, SFO also houses a large Rental Car Center. AIR Train Blue Line, an automated people mover, connects all the four passenger terminals with Rental Car Center. Note that some rental car agencies also operate from an off-airport location. 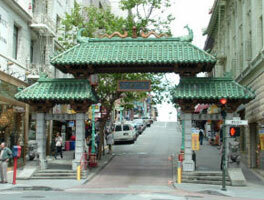 Nevertheless, all off-airport rental car agencies are served by free shuttle service from SFO. What's the age limit to hire a car for SFO? While the minimum age limit is 21 years, it could largely depend upon your rental car supplier. For instance, if you fall between an age bracket of 21-25 years, some suppliers may ask for young driver surcharge. Is an international driver permit required in San Francisco? As long as you have your driving license printed in English, driving a rental car from SFO should be an effortless job. On the contrary, if your driving license is not printed in English, you necessarily need to carry an International Driving Permit, in addition to your regular driving license.